Seating Arrangement Reasoning Questions and Answers. 1. Six girls are standing in such a way that they form a circle, facing the centre. 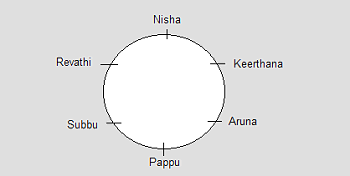 Subbu is to the left of Pappu, Revathi is between Subbu and Nisha, Aruna is between Pappu and Keerthana. Who is to the right of Nisha? 2. A, P, R, X, S and Z are sitting in a row. S and Z are in the centre, and A and P are at the ends. R is sitting on the left of A. Then who is on the right of P? 3. 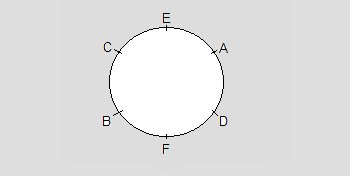 Six persons A, B, C, D, E and F are standing in a circle. B is standing between F and C. A is standing between E and D. F is standing to the left of D. Who is standing between A and F? Directions (Qs. 4 to 8): Study the following information carefully to answer these questions. 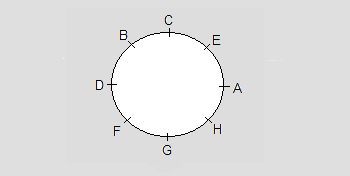 Eight persons A, B, C, D, E, F, G and H are sitting around a circle facing the centre. F is third to the right of C and second to the left of H. D is not an immediate neighbour of C or H. E is to the immediate right of A, who is second to the right of G.
4. Who sits between G and D? 5. Which of the following is the correct position of B with respect to H? Answer : (d) Both II and III. 6. Who is second to the left of C? 7. Which of the following pairs of persons has first person sitting to the right of the second person? 8. Who is to the immediate right of C? Directions (Qs. 9 to 14): Study the following information carefully to answer these questions. 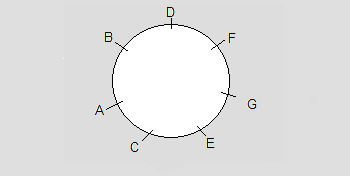 (i) A, B, C, D, E, F and G are playing cards sitting around a circular table. (iii) A is neighbour of B and C.
(iv) G, who is second to the left of D is the neighbour of E and F.
9. Which of the following has the pair with the second person sitting to immediate right of the first person? 10. What is the position of C? Answer : (e) None of these. 11. Which of the following has second person sitting between the first and third person? 12. Which of the following is wrong? Answer : (c) B is to the immediate left of D.
13. Which of the following is correct? Answer : (d) B is between A and D.
14. Which of the following will be D's position after E and D interchange their places? Answer : (d) Neighbour of G and C.